If you fancy some winter sunshine (combined with surfing and relaxation), you don't need to travel as far from Europe as you might think. 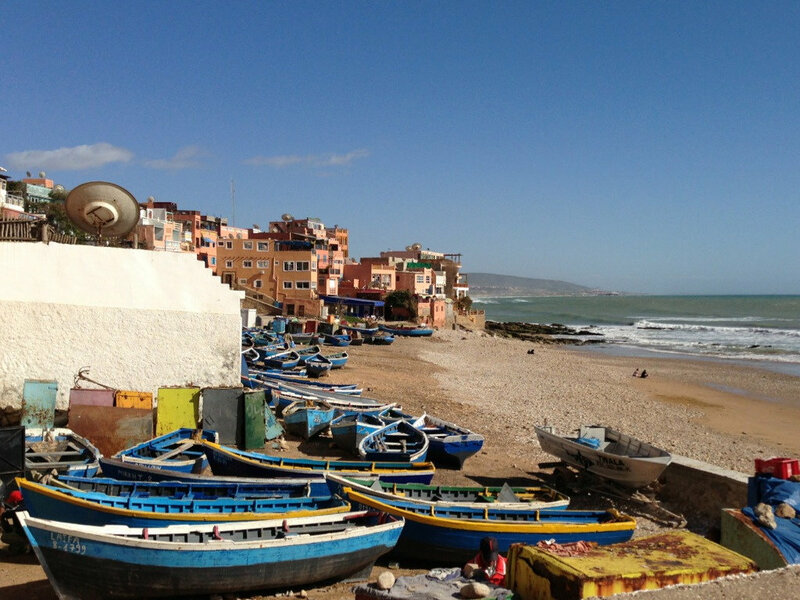 Taghazout in Morocco is less than an hour's drive north of Agadir airport and has become the premier surf spot in the country, with a climate that is warm and sunny throughout the chilly European winter. This small fishing town has a relaxed vibe with no large hotels, but plenty of apartments and pension hotels to accommodate the surfers who watch the forecast for storms in the Atlantic and then fly in when the surf is at its best through the winter months. 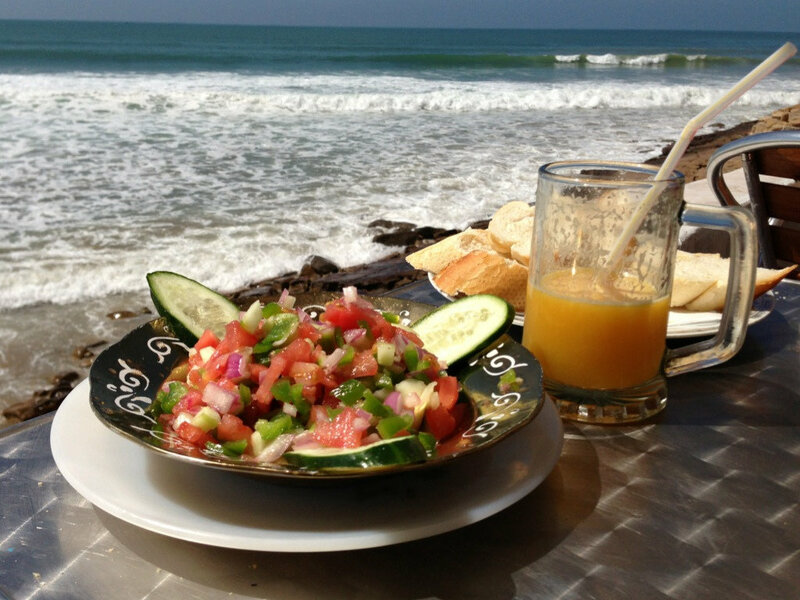 Taghazout is perfect for a winter or spring break, whether you or your family are planning on trying out the surfing or just enjoying the views of the ocean with the waves rolling in. There are several different beaches within walking distance and plenty of cafes and restaurants along the seafront where you can relax with a glass of freshly squeezed orange juice or a sweet mint tea. This is also the place to try a yoga class - many surfers use yoga to build up their core strength and keep themselves supple for catching the big waves. On the main road through town there are many small food shops and restaurants as well as souvenir and surf shops where you can hire everything you need and book surf lessons. Most of the beginner surf lessons take place on the long open Panorama beach. There is a parking place immediately above it that's popular for Moroccan families who set up for gatherings at weekends. The locals don't swim as much as the tourists, especially in the winter months, but you'll see lads playing football or families taking a walk along the sand. The beginners gather in small groups close to the shore for their lessons and manage to stand up for a few seconds before tumbling in, while the better surfers are further out and demonstrate a few curves before they too come off the boards. 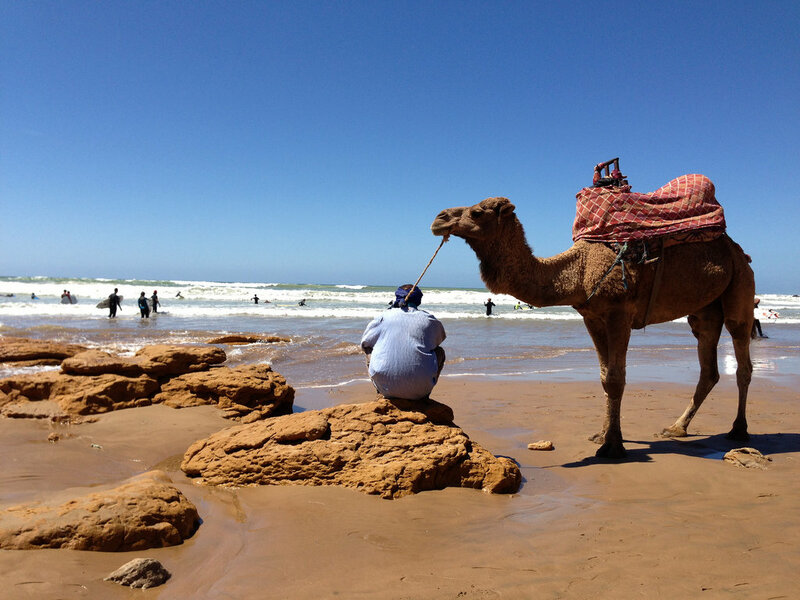 There are camels on the beach, ready to give you a ride up and down and a photo opportunity for that Morocco holiday snap to show your friends. Just around the point is the curve of Town Beach, where the blue painted fishing boats are pulled up on the shore, the seagulls drift on the swell, and a couple of temporary stalls set up to sell the fresh fish when there's a catch. Along this stretch there are cafes to hang out and relax in, such as the popular l'Auberge that also has rooms and serves European/Moroccan cafe food. We also enjoyed some fresh juices from the beach bar next door and sat in Sonia's cafe for a Moroccan salad and a great view of the surfers. 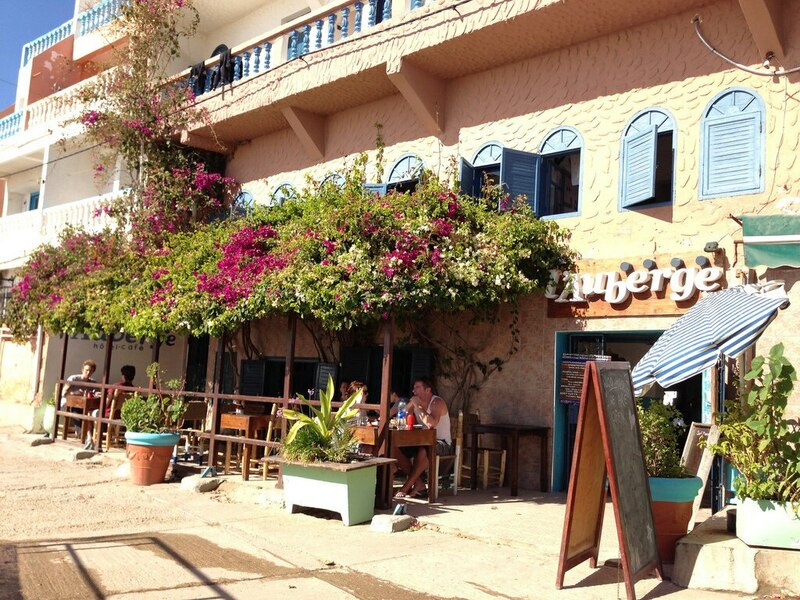 Walking along the paved path that skirts the sea front you'll come to Surf Berbere where they also serve food and snacks all day and run yoga classes on the rooftop. This stretch of shore is quite rocky, but popular with keen surfers who stay in the apartments along the shore and pop out when the surf's looking good in the early morning and evening. Further along the road, a short drive or a long walk is Anchor Point where you'll find the big waves for the experienced surfer, but for beginners and non-surfers it's fun to go and stand on the rocks and watch the pros perform. If you need a change from surfing, we recommend a day trip to Paradise Valley, which many of the hotels and surf camps can arrange. This rocky valley in the foothills of the Atlas was a hippy hangout in the 1960s when travellers came to camp and enjoy the blue pools and waterfalls, but is now a protected nature reserve. The coast road turns inland from Aourir and you'll probably get a chance to stop at the Argun oil co-operative where they have ladies who demonstrate how the oil is made and used for cosmetics and hair products, with a large shop and a lovely botanical garden at the back. 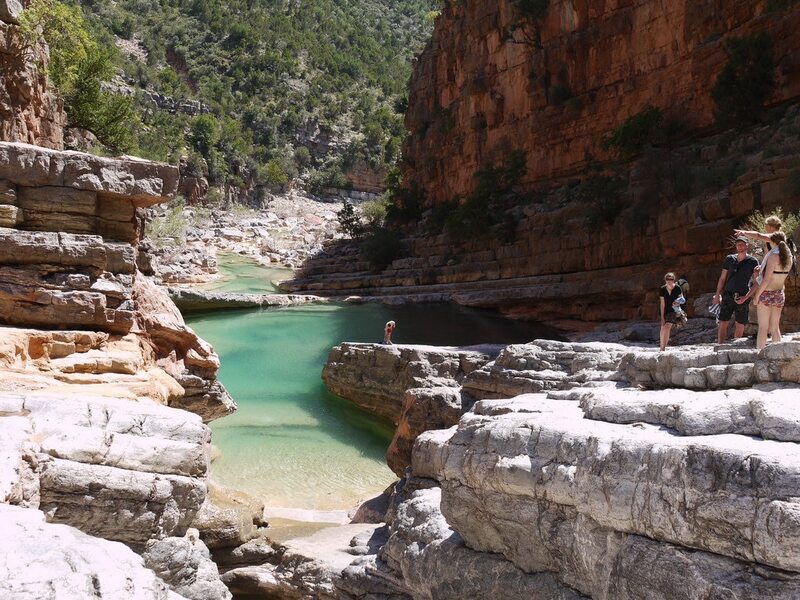 From the Paradise Valley parking area, you'll have to walk quite a way past some small cafes, crossing a stream before the river opens up at the first swimming place with flat rocks to sunbathe and cliffs and river pools to jump into. You shouldn't just stop here though, as further up the gorge along an easy path is a second swimming place with high cliffs to jump from and swim in the river, while further still is an area with more green pools and waterfalls that are full in the springtime, although dry in summer. 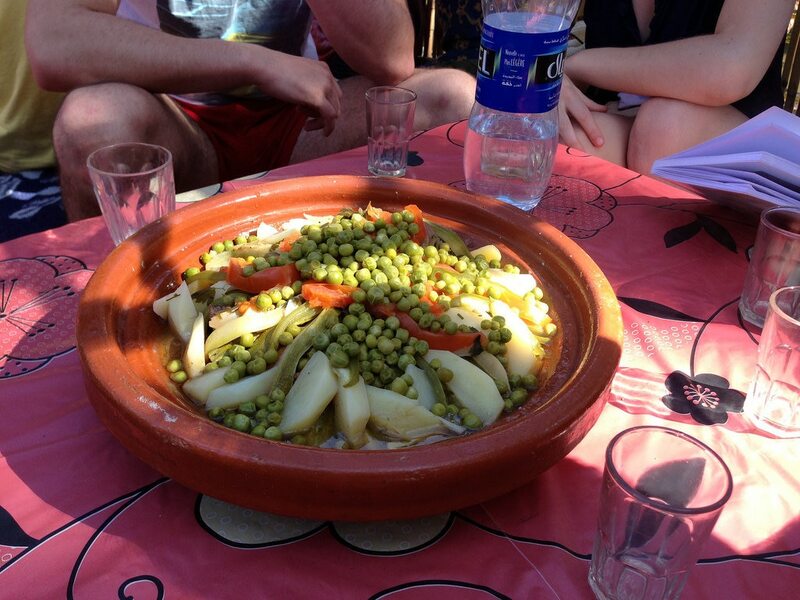 Our group's trip included a stop at one of the cafes for a breakfast of bread and amalou (a sweet paste of oil and almonds) on the way up and a traditional Moroccan tagine on the way back, which was cooked over the wood fire and made a wonderful end to the day. Another Moroccan experience that you may like to try is a visit to the Hammam in Agadir, which was also organised as a group trip by our accommodation provider. We booked a Hammam that was well used to tourists and where the staff spoke some English for our first experience. The men and women were treated separately in different steam rooms where we were slathered and scrubbed with special soap before being washed down with bowls of warm water. The treatment continued with a massage of almond oil where we were able to choose how hard or relaxing the massage would be, and finally we were brought a glass of mint tea while we got dressed. Taghazout is a great place to enjoy some sunshine and surfing in the winter and spring, but even if you can't see yourself on a surfboard, you can sit in a cafe with a view of the ocean, walk along the beach, and admire the skill of the surf pros catching the perfect wave. Fly into Agadir airport on Morocco's Atlantic coast and pick up a hire car to drive up the coast road to Taghazout (aprox drive time 1 hr). If you plan to do a lot of surfing a hire car is useful to get to the best surf spots but not essential if you are a beginner, or book a surf camp package which will provide transport to take you to different beaches every day.